This was a funny picture on the Metro in Washington D.C. on Wednesday. Apparently some people threw off their Costco jackets (I think with name tags and all). They were not neatly folded, but sort of angrily shoved there. As people got on the train looking for a seat, over and over their eyes did a widening and they paused, some said, "What's that? 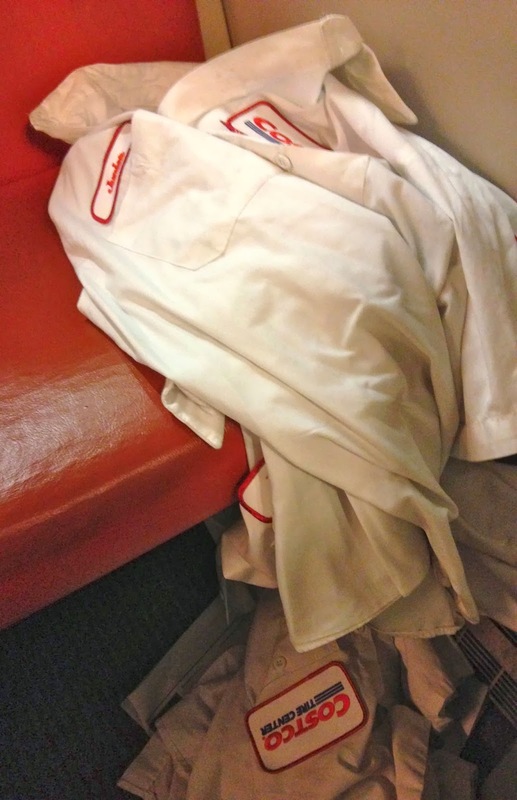 Did someone leave their clothes on the train?" Two teenage girls and a boy started laughing and pointing. No one would actually go near these--maybe they were afraid of germs or to get involved in whatever happened here. Well Costco, if you're looking for some of your long white jackets with emblem (one from your tire center), you may want to contact the lost and found in WMATA. Labels: Branding, Clothes, Commuting, Costco, Fashion, Funny, Metro, Photo, Quit, Train, Transportation, Washington D.C.
MetroOpensDoors.com is a website name for WMATA trains in/around Washington, D.C. So this was Metro opening the train doors today. Unfortunatey, it was the wrong doors--the ones facing the tracks, and not the side with the platform. I took this photo with the doors open on the wrong side. I wondered what would have happened if the trains had been full and someone was leaning up or against the doors--they could've actually fallen off/out of the train. Where exactly are the safety features so this doesn't happen? Labels: Commuting, Dangerous, Department of Transportation, Failures, Investigation, Liability, Metro, Mistakes, Photo, Regulation, Safety, Trains, Washington D.C. 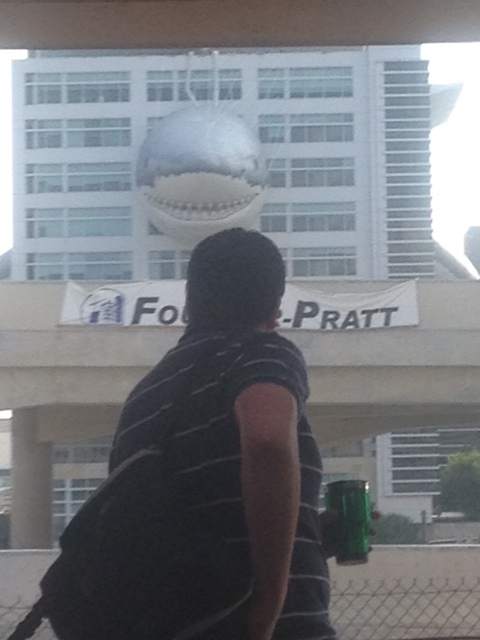 It's annual Shark Week--apparently, there is now a dedicated week for just about everything. Although I am not sure how that works with only 52 weeks a year...unless every week is "dedicated" to multiple honors, rememberances, etc. Like they say, everyone/everything gets their five minutes of fame. This picture is of the Discovery Building in downtown Silver Spring. Yeah, there is a ginormous shark head hanging off the side of the building (and you can see a little bit of the fins and tail hanging off the sides). This guy, turned around and staring at the shark head, practically missed his ride, but then again this is not something you see everyday on the way to work. Labels: Commuting, Discovery, Fame, Funny, Gefilte Fish, Honors, Jaws, Photo, Remembrance, Washington D.C. 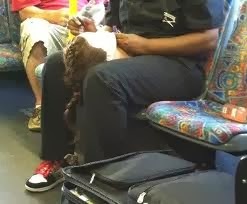 This photo was just wild from the metro bus today. Some lady--assume she's a cosmetologist in training--working on this mannequin head on the Metro. She's got her luggage bag spread out open on the floor of the bus, a drink bottle laying on the seat next to her, and a mannequin head between her knees. And the lady is slowly, carefully applying eye liner as if she's sitting in some luxury day spa or something. While I admire her work and the practice, the image was just a little surreal on the bus to work. Letting imagination go wild...if she held up the head by the pony tail with blood and guts dripping out and brandishing a large butcher knife, then I can see this scene going to a whole new level of scary-crazy. But that's what city life, commuting, and to a great extent work is all about--the next personality you come across and all that they are cracked up to be.